Fifteen Digits by Nick Santora, a Mysterious Review. 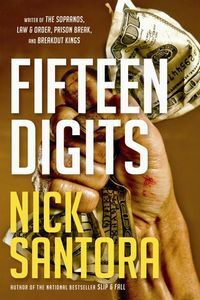 Review: An ambitious law school student is goaded into taking a short cut to the good life by an even more ambitious lawyer in the crime novel Fifteen Digits by Nick Santora. Rich Mauro believes that by studying hard and working harder he'll achieve his financial goals. He's also luckier than most; Max Seymour, a friend of the family, is a partner at a prestigious Manhattan law firm, not only gets him a job but promises to pay half his tuition if he keeps his grades up. The job is menial and Rich is literally starting at the bottom, working for the firm's printing office in the building's basement. He's happy but troubled that the love of his life won't wait for him. Elyse Crane is the daughter of wealthy parents, who clearly believe she can do better than Rich. Jason Spade is the son of another partner at the firm, someone who resents his father's influence over everything he's done in life. He wants his independence and his salary and allowance from a trust fund, though substantial, isn't nearly enough. Recognizing a weakness in Rich, he devises a scheme in which the two of them leverage their respective positions in the firm to do a little insider trading, not enough to be catch the attention of the authorities but enough to get them what they both want. Rich agrees, but insists his three co-workers in the printing department are included as well. So that no one has an unfair advantage over the profits, each contributes a 3-digit code — known only to them — to a 15-digit account number, which gives the book its title. He was tired. Tired of being around people and conversations and boats and a million other things that made him feel like he didn't belong. He didn't fit in with that world. But he knew he didn't fit in back in Astoria either. He'd always thought he wanted the rarefied air of big firms and Manhattan living and all that went along with it, but now that he was getting a lungful of that air, he was finding it hard to breathe. The second half of the book is basically an expanded version of what is mentioned in the preface: "People would be maimed, tortured, and killed. Millions of dollars would be stolen, then stolen away from the thieves themselves." So there are no surprises awaiting the reader, though it is well written and exciting. Still, one can't help but wonder, had the author have been a little more restrained in the first half of Fifteen Digits in foreshadowing what was to come, might not the second half have been a little less predictable and thus more suspenseful. Acknowledgment: Mulholland Books provided an eARC of Fifteen Digits for this review.